I mentioned a salted egg and prawn dish I made with my Aunt a couple of weeks ago. Which aptly coincided rather neatly to my mother preserving her own eggs over Christmas. W.I eat your heart out. As I’ve never salted them before and my mum swears it tastes a million times better, I thought I’d get some duck eggs and give it a shot. 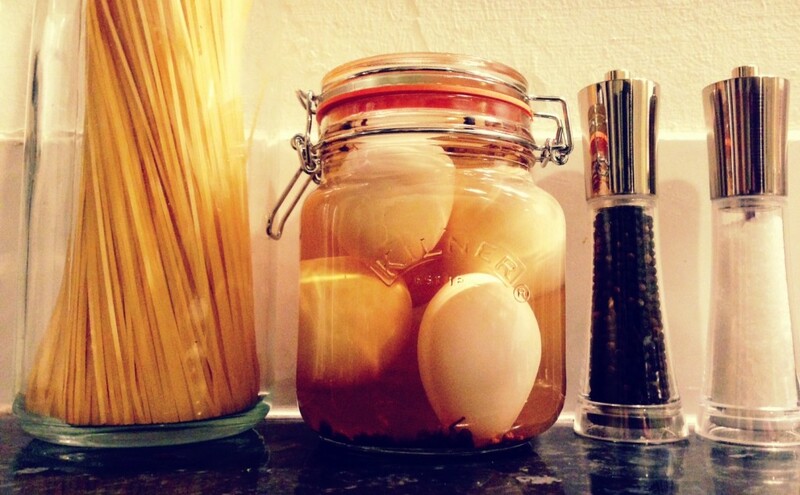 Wash your duck eggs. In a clean jar put the salt and boiled water together, stir until all the salt has dissolved. Add the rice wine and peppercorns. Wait until the liquid is room temp before you add your duck eggs. Leave for at least 1 month. So I’ll post some recipes involving these bad boys in at least a months time. Laters. I’ve been getting a lot of cucumbers in my veg boxes as of late, and I was simply not getting through them enough. 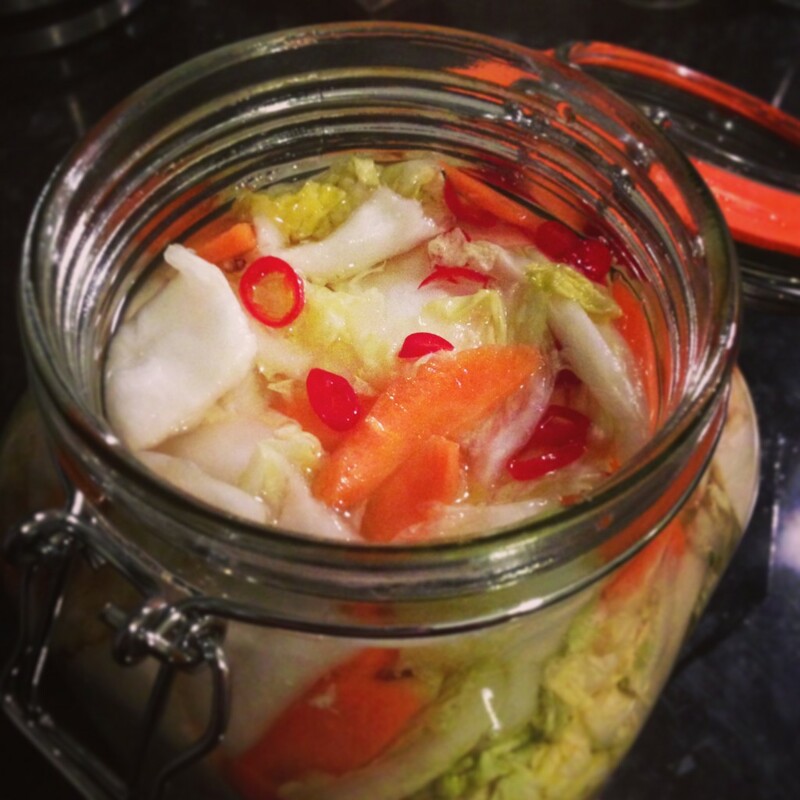 So at times like these I really love to make this simple Asian salady side dish. There’s a lot of variations of these dishes across the swathe of Asia and the only reason I’m not calling strictly calling this a Chinese pickle recipe is because I’ve not added any rice vinegar (but it is cured with the salt). Serving cucumbers in this fashion is most like Korean namul and it’s those variations of veggie sides that I love most about Korean BBQ’s. You want to slice the cucumber into long strips at around 2-3 mm thick. I used to do this by hand with a filleting knife, but my cousin and his wife bought me a voucher for a cooking store last year and I got a mandolin…man…I’m loving the mandolin. When you’ve got lovely long thin strips, cut away the cucumber seed areas. Yes, I know you can eat these, but for the purpose of this dish they add way too much water, so get rid. In a sealable container add all the above ingredients and mix until all evenly coated. You might think that there’s just a bit too much salt in this, but the salt helps draw out the water from the cucumber giving them a nicer bite (and that water will eventually dilute the salty flavours anyway). Now put them in the fridge overnight and enjoy the next day. This recipe is pretty adaptable to your tastes, you can even add a bit of soy, grated ginger or garlic if you would like. The veg is really interchangeable: cabbage, carrots, beans, bean spouts, radish, kohlrabi…some of these veg you’ll want to par boil. 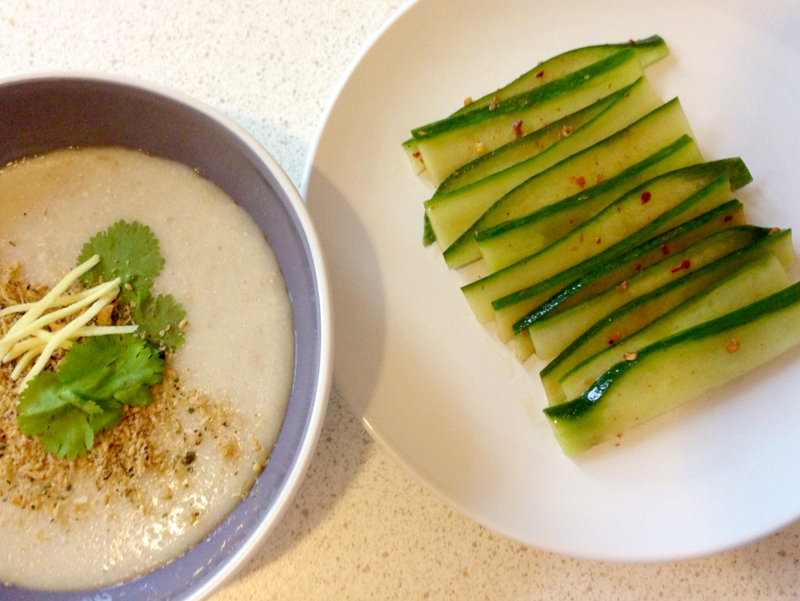 I’ve served my cucumbers with a congee made with rolled oats – a healthier version of congee perhaps, but mostly because I didn’t plan to cook the rice early enough for making nice creamy congee.